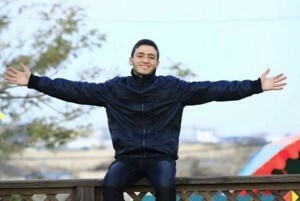 RIP Anas Qandeel: Long live Palestinian intifada! Israel & its alibi agency (the media) talk about Israel’s precision bombing in Gaza to take out the homes of Hamas commanders, as if Hamas was an army with a command structure & bombing their families along with them was legitimate military practice rather than war crime. Overwhelming photographic documentation puts the lie to all this hasbara horse manure by showing Israeli aircraft indiscriminately dropping massive bombs over Gazan cities & creating massive property damage in residential areas. There’s nothing precision about it & that constitutes war crimes. Is the UN or Human Rights Watch taking note? Or are they still on the sidelines shaking their naughty fingers at both sides? Of course, when you call a spade a spade, standing on the sidelines in the midst of ethnic cleansing is tacit endorsement. What Israel actually means by “precision bombing” is that the many Gazan infants & children we see in photographs being treated for injuries or prepared for burial (those the Israeli politician called the “little snakes”) & their Palestinian mothers, are precisely the ones Israel is going after. That’s why it’s called ethnic cleansing. It’s too gruesome to post the photos of those small children. One feels daunted by the criminality & military might of Israel which we need our psychic & political energies to oppose. This is a photo of 17-year-old Anas Qandeel, a young Gazan teenager killed along with his father in an Israeli airstrike. Again, precisely the ones Israel is going after. His FB cover photo is an image of intifada with the inscription in English & Arabic: “Palestine Resist”. He wrote on his wall just a few days ago: “I cannot sleep. When are you going to attack my home & finish?” This young boy wasn’t taunting fate; he was expressing trauma at hearing & huddling from hundreds of Israeli bombers trying to take out all of Gaza.